Neil deGrasse Tyson has taken his hit podcast show, Star Talk Live, on the road. His first stop was at the Neptune Theater in Seattle where Tyson had special guest Wil Wheaton on to talk the science in Star Trek, plus comedic commentary from Kristen Schaal, Paul F. Tompkins, and co-host Eugene Mirman. The crew talked a gambit of subjects from self-opening doors to alien sexual relations. Hit the jump for the video. Astronomer, entertainer, and proprietor of scientific thinking, the fantastic Neil deGrasse Tyson chatted up Wil Wheaton on the first live showing of Star Talk Live, Tyson’s hit science podcast. Comedic banter is abound in this half hour of greatness. What surprised me most? When Tyson said that, out of all of the space-age tech seen on TOS, the one technology he thought would never be possible: self-opening doors. Wil isn’t the first Trek guest on with Tyson. 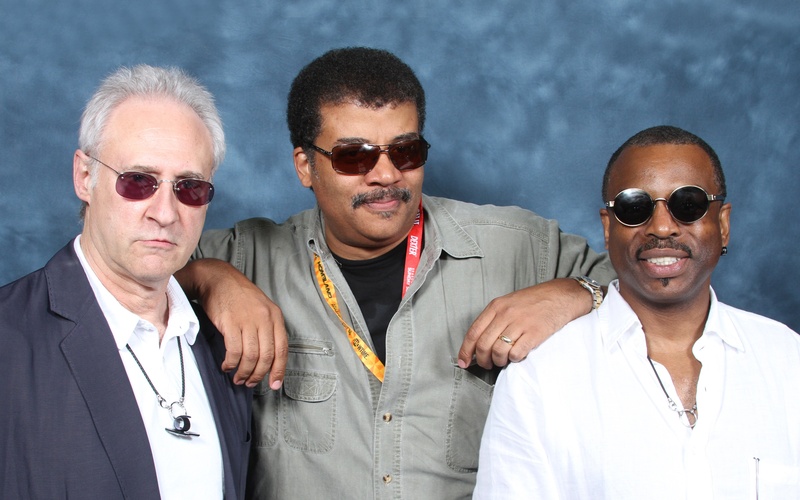 Listen to Neil’s interview of two more TNG greats, Brent Spiner and LeVar Burton, live from San Diego Comicon 2012. I think that the comedians were out of their league. Did you catch the light-year comment one of them made? Which led to a lesson by Dr. Tyson. I met Dr. Tyson this past summer at Comic Con at our hotel. He is a deeply cool guy who graciously agreed to pose for a photo with my wife and I (even said goodbye to us both as he left the restaurant later; I was a tad star struck). He also has a great laugh and is, IMO, a perfect successor to the Carl Sagan legacy. I look forward to his COSMOS revival…. @Sebastian S. (2), I saw Wil Wheaton live and in person at one of those popular theatrical venues in Los Angeles — I believe it was on La Cienega. A smaller but very well-respected place, and he was playing a part in a satirical production based on a fictional radio show from the Golden Age of Radio. In any case, while I didn’t have the chance to meet him, I have the sense that he is a very genuine individual with a great sense of humor whose love for the genre is as real as it gets. He is a sci-fi geek in the best sense of the word. And I think he follows real science and real technology quite avidly, from what I’ve seen. It’s always great to see fellow fans of science fiction make forays into the adjacent world of science and technology, and it seems to me that Wil has what it takes to make it wherever that world will take him. For what it’s worth, when I was a kid, I, too, made up buttons for fictional control boards on the bridges of fantastical spaceships. I distinctly remember drawing button arrangements on pieces of paper, setting them on a table as if they were part of a panel, and pressing them as needed to fulfill the requirements of my fictional “mission.” Unfortunately — or perhaps fortunately — there weren’t any cameras around recording the event…. I had not heard of that podcast before. It is very entertaining! I also got Dr. Tyson’s autograph once. He was jazzed when he found out I was a physics and astronomy teacher which led to a great conversation. His videos are great to show to students, he is very animated and excited about science. He’s the best! Dr. Tyson’s podcast is a great listen. Off topic, but I take it from your moniker you are also a fan of “Mad Men”? And yes, Tyson is a great guy. When I met him he was wearing an Indiana Jones type shirt and fedora (I made a Indiana Jones joke to him, and he had a great laugh at it). He seemed really laid back and cool. But when he walked by our table to say goodbye to my wife and I as he left the hotel restaurant? I was a bit geeked out. That was probably one of the coolest encounters I’ve had at Comic Con because it was purely accidental; not paid for, nor did I wait in a long line and he was so nice about it. I saw him at a couple of conventions in Pasadena about 7 or so years ago. He talked to my friend and I (posed for pics, too). We talked about his blog (which my friend and I were fans of). He is very funny and insightful, too. But the coolest thing I saw of him was a little moment he had with a very young fan (very shy too; she was only about 5 or 6 years old), and he was so patient and good with her. He didn’t condescend to her, either. I stood off to the side and watched and he was just great. Saw Wil Wheaton at the Montreal comicon and he was fantastic. By far the most down to eatth out of all the guys there. Spoke to him at the autograph signing and he seemed very genuine. Spoke to Brent Spiner and he was incredibly arrogant. I thought you said you were taking a five month break from this site? No, I said I wasn’t going to be going onto any spoiler articles. I said I would still come to the Science Saturday article and all non-movie related stuff. I said I would be back posting on the other articles after I see the movie in May. This may seem off-topic, but could could Trekmovie do a brief if modest tribte to Sir Patrick Moore, who died today aged 89. One of the greatest astronomers of our time, who brought us closer to the sky at night. This would have been better without the “comedians” on the left. So irritating. Not funny. Why were they there? Why must they step on Dr. Tyson every time he’s trying to explain something. Oh God that was brutal. They really had the geek amps on overdrive there. @Sebastian S. (8), what a great story. I’m very happy that Trek attracts people of Dr. Tyson’s quality and concern for others. Both Wil and Dr. Tyson seem like guys you’d invite over to a holiday party in an instant and never fear a dull moment. Now THAT would be a holiday party I wouldn’t want to try to get out of attending (ha ha)…. Someone was arguing with Gene about aliens building the pyramids? Dr. Daniel Jackson? Poor Daniel. Nobody believed him. When Sir Patrick Moore was born, TIME magazine was all of two days old. Hockey Night in Canada began broadcasting the same month. And the famous Hollywood(land) sign in Los Angeles had yet to be inaugurated. The year before, the Andromeda Galaxy was determined to be a great heavenly body outside the Milky Way, and not merely a nebula. Two years before, a young Albert Einstein was awarded the Nobel Prize in Physics, but not for his work on relativity, on which he had labored for more than 16 years. The mathematical equations for the properties of a black hole were yet to be devised, and those exotic stellar phenomena would not be popularized in science fiction until Moore was in his forties. Indeed, much has changed since Patrick Caldwell-Moore was born. We can now see into the further reaches of the universe. We can use gravitational fields of distant objects as telescopes. We have sought, and found, hundreds of planets outside of our own Solar System. Yet much has remained the same. The universe is full of mystery, full of wonder, full of the unknown. A man of his convictions, there was no mistaking Moore for any other astronomer. Self-taught, he was anything but conventional. He popularized astronomy for millions and made the common telescope among the dark sky a route to the heavens above. In his mind’s eye, he might have traveled billions of light-years and back, and his prose brought the wisdom of his travels to the common man. Many are those who live their live without wonder, who look at the ground below not knowing that nothing separates them from the distant quasars except an expanse in the substrate of spacetime. Patrick Moore was the oppose of these, and a bringer of knowledge to those who sought signs and wonders in the heavens, and found there, instead, fact and an iccomparably greater appreciation for the cosmos. Can they get this guy (along with a few other celebrity scientists like Alan Lightman, Michio Kaku, Stephen Hawking and maybe the ghost of Carl Sagan) to screen Into Darkness before it’s done? It would be nice to get the science (even the speculative stuff) of the 2260s righter this time around. PS. Nice to see you ’round here Paul. Is it actually possible to go to the main page without getting spoiler-ed :)? @Jack (20), I suppose if they hold a seance…. Thanks for the great link and story! I ended up watching the entire video, and I wish it had been just Wil and Neil but at least the comedians didn’t ruin it. :) Thanks for posting this! Wasn’t Tyson the one that “outed” Pluto as a planet? Am I the only one who noticed that Neil kept referring to Wesley as “Welsley”? I guess Wil was to polite to correct him. Otherwise it was a great interview. It would have been much better without the lame peanut gallery of no-name comedians. One does not simply correct Neil deGrasse Tyson. Mr. Crusher will now be known as Wellesley. I remember debating a fellow Trekker about the difference between Star Wars and Star Trek. I said Star Wars was science fantasy. Star Trek is science fiction. She disagreed and thought Star Trek was also science fantasy. I wrote that much of Star Trek had a basis in science. The communicator become the cell phone. Medical scanning becomes MRI. Warp drive has a basis in science. She still didn’t agree. I wish she could see this video and read the other science articles that relate science to Star Trek.